A softliner is a cushioning material that conforms to the shape of your mouth. – The bone ridge and gums shrink & reshape during the healing process. – Softliners improve the fit of a healing denture or partial by closing the gaps that develop. – Helps your healing denture or partial feel tighter and more comfortable. How many chairside softliners will I need? 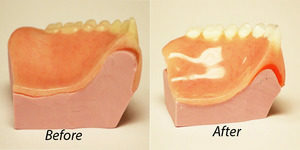 Our denture package includes 4 free softliners. However, some mouths heal slower than others, like smokers and diabetics. Additional softliners can be purchased. The first softliner is placed approximately 10 days after the teeth were extracted.